If you spend any time online, the chances are good that you’ve taken in, perhaps enjoyed, a short film of a flash mob — typically singers or musicians or dancers suddenly appearing in a public space, performing a well-rehearsed number and then vanishing back into the comings and goings of an ordinary day. Well, here’s poetry, flash-mob style. PUP: Pop Up Poets/Poets in Unexpected Places is a New York-based group of poets that stages readings in unexpected places: ferry boats, trains, laundromats, grocery stores, even at Victoria’s Secret! It’s not about passing the hat; it’s about placing “poets and spoken word artists into the public arena” — public being the operative word. Here’s a swell article on PUP in the The New York Times. Find out more on the Pop Up Poets website or on Facebook. 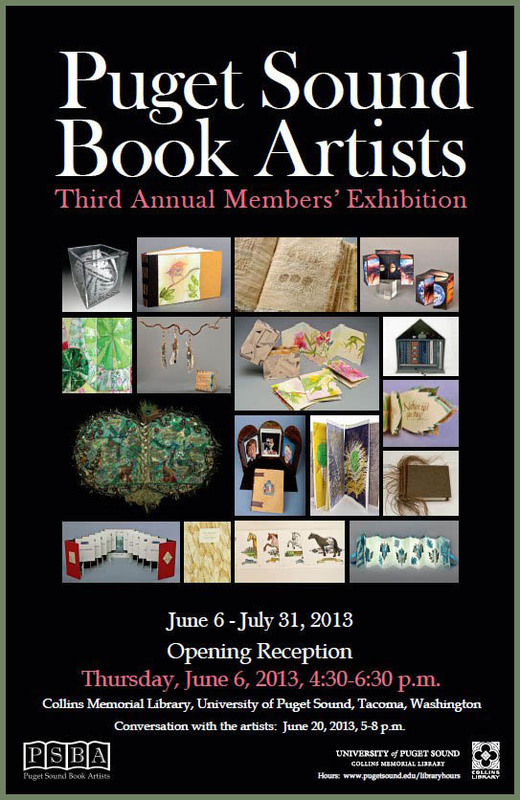 The 3rd Annual Puget Sound Book Artists (PSBA) Members Exhibition opens next Thursday, June 6, 2013, in Collins Memorial Library on the University of Puget Sound campus, in Tacoma. 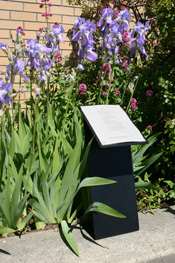 The exhibit features the work of 30 artists who explore the many permutations of the book as object. The work remains on display through July and there will be a conversation with the artists in mid-June. Learn more about PSBA and the exhibition on the PSBA website and on Facebook. We’re always happy to see “local” poets featured in distinguished publications, so we were pleased to see “Cookbooks, Compost Heaps, and Poetry Booby Traps: A Conversation with Poet and Pie-maker Kate Lebo” in Ploughshares Literary Magazine. 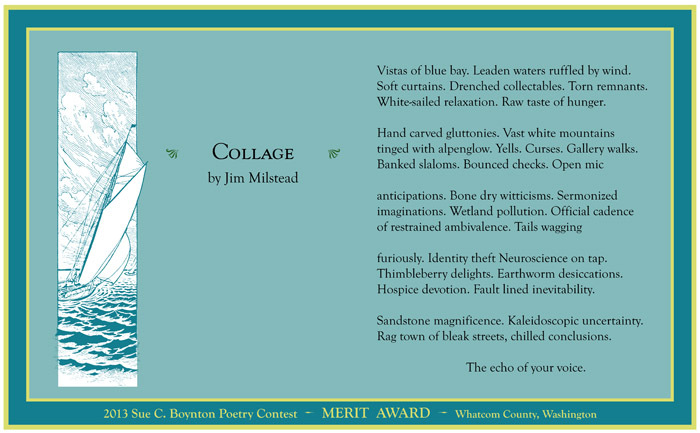 The prize-winning poet, pie-maker and instructor is an MFA graduate of the University of Washington and the former registrar and volunteer coordinator at Richard Hugo House. Her handmade book, A Commonplace Book of Pie, became a surprise bestseller and will be published in October as a full-length illustrated book by Chin Music Press. Read more on Kate Lebo’s site, Pie School, and visit her Etsy store to pick up one of the few remaining copies of the original Book of Pie. In workshops and retreats throughout the world (and online), Barbara supports and encourages participants in this creative exploration. Barbara will be in Bellingham to talk about Freefall and read from her new book, Writing Without a Parachute: the Art of Freefall (Vala Publishing), on Sunday, June 2, 2013, at 2:00pm at Village Books. Come meet Barbara Turner-Vesselago at Village Books and learn more about Freefall writing. Vistas of blue bay. Leaden waters ruffled by wind. Soft curtains. Drenched collectables. Torn remnants. White-sailed relaxation. Raw taste of hunger. tinged with alpenglow. Yells. Curses. Gallery walks. furiously. Identity theft Neuroscience on tap. Hospice devotion. Fault lined inevitability. Rag town of bleak streets, chilled conclusions. *Copyright 2013 by Jim Milstead. Placard design by Egress Studio. I want to be free in the mountains. Each one is for whoever wants to own the mountain. A flag for each person so there’s no war. There’s plenty of room for everyone. 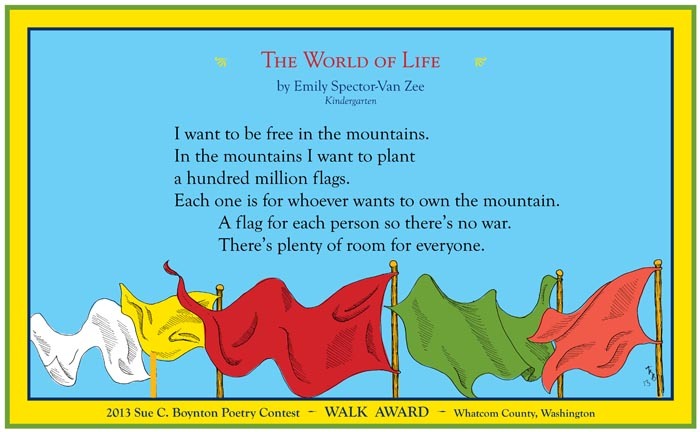 EXTRA congratulations to this year’s youngest Boynton winner, 6-year-old Emily Spector-Van Zee, who, in addition to her Walk Award, has also won first place in the Kindergarten category for the KBTC PBS Writer’s Contest. See Emily’s illustrated story here. She is now being entered into the national PBS contest as the Kindergarten representative for Washington state! Emily and her story will be recorded, animated and featured on TV throughout western Washington. *Copyright 2013 Emily Spector-Van Zee. Placard design by Egress Studio.